Denon has announced the arrival of its latest range of luxury audio goods, the all-in-one CX1 stereo system. The CX1 system comprises a Super Audio CD receiver (the RCD-CX1) and a speaker system (SC-CX101). First up, the SACD receiver is encased in aluminium housing, has a powerful amplifier circuit and is constructed to be vibration-resistant. This is due to the company's SVH (Super Vibration Hybrid) mechanism. Denon also uses AL24 Processing to enhance the sound of its receiver, that's compatible with SACDs, music CDs, rewriteable discs, MP3 and WMA audio tracks. The speakers in the speaker system are made up of a 12cm woofer unit that contains newly developed glass fibre DDL cone and 2.5cm tweeters. This is all encased in a non-magnetic die-cast aluminium frame, which is finished off with a wood-grain veneer cabinet. Sound-wise, you will get up to 150W out of these beauties. Rounding off the feature set, you will find a built-in radio tuner (non-digital) and a place to dock your iPod. 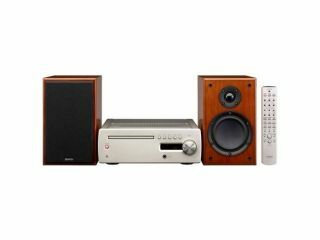 This pricey set will put you back £1,299 for the main RCD-CX1 unit and £599 for the SC-CX101 stereo speakers, when it is released at the end of this month.